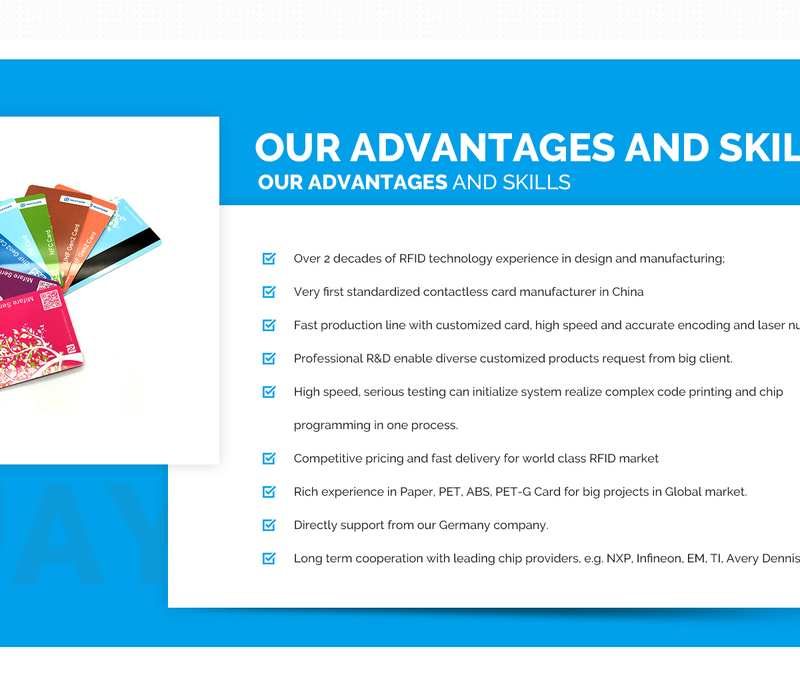 5, Card Manufacturer Shanghai Huayuan Electronic Co., Ltd profile. HUAYUAN electronic has been active in the smart card industry since 1995. The HUAYUAN RFID Card factory is professionally and efficiently organized for manufacturing high quality plastic cards, smart cards, contactless cards, NFC tags and other serial RFID products against competitive pricing. From 2005, our market expanded to Europe and the USA, 70% of our production was exported for public transportation E-tickets, security and loyalty cards, entertainment park tickets, security access control cards and campus cards. We contributed as a member of ICMA (International Card Manufacturing Association), the NFC forum and the RFID Journal. HUAYUAN is a close Asia Partner of Avery Dennison, we have invested in and involve in RFID etching antenna manufacture, RFID bonding, inserting and converting manufacturing in big Shanghai area. HUAYUAN continuously develops and innovates passive RFID manufacturing technologies. Our tamper-proof RFID inlay is a top lead product and the first choice of the biggest Chinese brand protection project with more than 50 million tags annually. HUAYUAN has extensive knowledge and experience in industries of service in FMCG, Auto, Manufacturing, Trading, Electronics and High tech production, providing solutions for sale, implementation and maintenance for the FMCG industry, IT outsourcing, BPM solution development, Web application development and APP development. HUYAUAN is also deeply involved in upgrading RFID asset tracking techniques and inventory management with the replacement of barcode technology used in the past 30 years. - Contactless cards, tag printing, manufacturing with laminated RF NFC .